Steely Dan, at their commercial and artistic peak, were a trio of Donald Fagen, Walter Becker, and producer Gary Katz, ably supported by a large cast of top notch studio musicians. They were a studio-only band, focused on the painstaking creation of recordings that were rich in musical and lyrical detail. But Steely Dan began as an actual band that split its time between recording and playing live. Do It Again is one of the standout tracks from this early period. This band recorded two albums, Countdown to Ecstacy and Can’t Buy a Thrill. Becker and Fagen were writing complex harmonies and long songs from the beginning, but these early albums have a stripped down feel compared to what would come later. There is also an immediacy in these early albums that would be replaced in the later work by a glittering sheen of artifice that gave albums like Aja its perfect pop sound. I love both periods of Steely Dan, but I can hear a random track and tell you which period it belongs to. Do It Again is one of Steely Dan’s most direct lyrics. In one word, this is a song about recidivism. The song could be about one person, but I hear it as being addressed to people in general. It says that we cannot overcome the worst aspects of our natures. It identifies crime or violence, love, and gambling as bad habits that we are destined to return to once we have tried them. The song can be taken as a warning or an excuse, but it also serves as a template for the characters who inhabit most of Steely Dan’s songs. You may not ever want to meet such people in person, but you will keep coming back to Steely Dan’s music to learn more about them. For the rest of the 1970s and into the 80s, that is just what music fans did. Springsteen made me want to become a guitar player--the opening chime of The Ties That Bind's riff was one of the greatest sound my 7th grade brain had ever heard. I knew then and there I wanted to play guitar. I distinctly remember going to my New York Yankees tin 'piggy' bank, pulling out about one hundred dollars in assorted bills--my haul from various birthdays, Easter Sundays and gifts slipped to my from my Grandfather--and handing it to my mom. I said: "I want to buy a guitar." Why did I give it to my mom to keep? I don't know--maybe I was worried, now that I had decided what to do with my loot, I might lose it? Who knows. I was buzzing, full of that strange, ritualistic kind of magic a great song casts over you, especially when you've just heard it for the first time. I bought that guitar--still have it actually. And while Springsteen (who've I've written about many times here, and undoubtedly will again) may have influenced my to start playing the guitar, it was John Squire, guitarist for the Stone Roses, who, a few years later would influence me in how I wanted to play, how I wanted to sound. There's a profound difference, one that speaks to the development of nuance, of how influence works within and directs artistic vision. Vision is followed by execution and the direction one tries to follow. mistakes in that journey, missteps, can be brilliant errors and lead the player (writer, painter, sculptor, et al) in unseen directions and yield unintended results. And in art, especially music, the accidental discovery is the greatest place to find one's self. 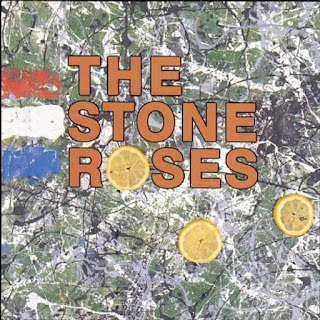 The Stone Roses, like many of the artists I choose to write about, have had years of press, miles of copy, to proclaim their greatness. The combined shimmering, chiming 60s influenced guitar rock, mixed in magical harmonies and set it to a hybrid Rolling Stones/ dance hall groove that resulted in one of the most unique, influential and flat out brilliant sounds of the 1990s, or any era. Squire was a true ax-smith and his tendency to lay down long, multi-layered grooves that alternated between funk, pure pope, power chord aggression and biting, fired up solos is a sound unmatched in alternative rock. When I play guitar, I tend to emulate Squire's verbosity, his need to roll and roll and roll, stabbing at the guitar at times, letting it know when to ring out and chime like church bells on a Sunday. Squire taught me what a glorious, multi-toned and many voiced instrument a guitar could be. He is one of many who have given the guitar, as a concept, a new voice. Guitarists will forever argue over the merits of their heroes, comparing skills, dexterity, prowess, super powers...For me, John Squire delivers brilliantly on such a sonic level, from tone to soundscape, that he is forever at the top of innovative guitarists.